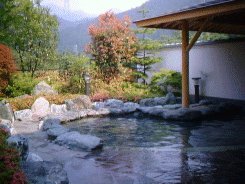 "Arafune-no yu" is the town-run hot spring made along the road which connects the "Shimonita" of Gunma Prefecture and "Saku" of Nagano Prefecture. 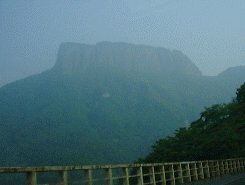 This name was stuck from Mt Arafune which was a picturesque scenery area just near here being. It is the still new building that it could be done in summer in the ninth year of Heisei. There is a townsman sport establishment, too. A speciality (Shimonita Welsh onion , konnyaku, pasania mushroom) is sold very cheap along Route 254 around Shimonita-town. It is widely comfortable with the open-air bath, the inside bath as well. Temperature is being made a little hot. There is a sauna room, too. A hot spring seems to be heated. The water of the hot spring is clear, and no smell . When Monday is a public holiday, it is closed on the next day. Get off by Nagano expressway Shimonita IC, and go to Saku direction through Route 254. 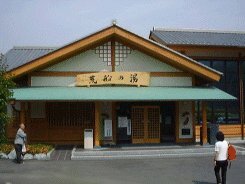 When it passes Shimonita town office, you will find a big sign along the national route. About 30 minutes from Shimonita interchage. A parking lot is large. It is the taste of the konnyaku of the home. The Japanese vermicelli made from konnyaku is neat food for summer. That right is Saku side. Mt rock looks like the shape of the ship. We went to Kouzu stock farm which was the stock farm of the Japanese beginning near Mt Arafune. When we reached the farm,the shop in the farm was closed, because business hour is finished at 6 o'clock. You will be able to eat fresh milk, ice cream during the business hours. A way to the stock farm is to be careful of the operation because it is a narrow mountain pass. The guidance of Mt Arafune in Uchiyama pass made by Saku City tourist society. Mt Arafune is the extinct volcano which has the shape of a ship to rise in the divide of Shinshu and Joshu. Height above sea level is 1422m. When you see a mountain from Saku side, it seems that the right of the mountain is a bow, and it will seem that the left is a stern. The commemoration stamp of Mt Arafune is issued in the 45th year of Showa.